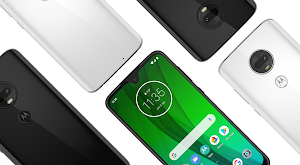 While these phones run the gamut of prices and features, they have a few things in common—including large screens, portrait mode-equipped cameras, expandable storage, and of course, full compatibility with Project Fi. Here’s the scoop on each of our three new devices. The moto g6 (typically $249 but just $199 on Project Fi) is our most affordable Fi-friendly phone, bringing premium features—like a 5.7” edge-to-edge display and portrait mode—to a value-packed smartphone. It comes with a battery built to last, along with TurboPower™ capabilities for quick recharging. The moto g6 has 32 GB of built-in storage, and you can also add up to 128 GB of extra storage with a microSD card. Plus, with free high-quality storage on Google Photos, you never have to worry about running out of space for your photos. The LG G7 ThinQ ($749) is LG’s latest premium smartphone bringing a combination of useful features to a new design. Its 6.1” edge-to-edge display is both super bright and battery-efficient, and the phone’s Boombox speaker delivers a rich, powerful audio experience and deep bass you can feel. Finally, the LG G7 ThinQ puts smart, AI-powered features front and center to help you get things done more easily. Located just below the volume is a button that launches the phone’s AI functions. A single tap of this button will launch the Google Assistant while two quick taps will launch Google Lens, and its dual 16MP cameras intelligently suggest filters on the fly so you can capture the best shot effortlessly. The LG V35 ThinQ ($899) packs best-in-class features into stunning, lightweight hardware. With uninterrupted OLED-powered display highlights super vibrant colors, you’ll see photos and videos at their best. Like the G7 ThinQ, it comes with 64 GB of built-in storage—expandable by up to 2 TB with a microSD—and a high-performance processor, but paired with 6 GB of RAM, it enables super fast speeds for those who love to multitask. All of these features come together in an ultra thin and lightweight package—so portability is never a problem. If you’re ready to get your hands on our new devices, the moto g6 is already available for preorder. The LG G7 ThinQ and LG V35 ThinQ will be coming to Project Fi next month. In the meantime, you can learn more about these phones or sign up for updates on the Project Fi website to know when they are available. Whether you’re considering Project Fi or looking for a new device, these phones provide you with more options to choose from.